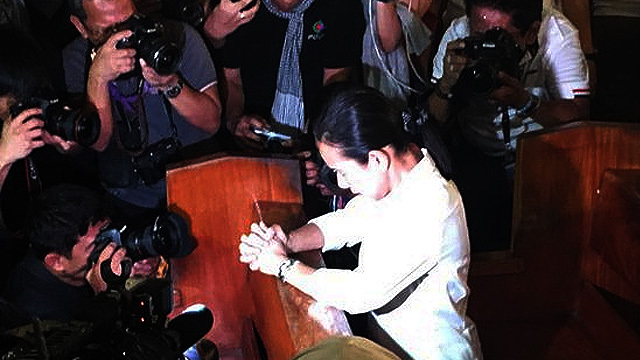 A photo of Senator Grace Poe kneeling while praying in church as she was surrounded by photographers and cameramen made the rounds online during the Holy Week. The photo was presumed to be taken while Poe was partaking in the annual Catholic practice of Visita Iglesia. Netizens pointed out that the seemingly innocent photo of the "pious" presidential aspirant was just a publicity stunt to gain sympathy from the voting public. Others added that it would be impossible for Poe to focus on praying knowing that her pictures were being taken. Some even labeled the senator as "plastic" and "pakitang tao" for the photo which they believe to be part of her campaign tactic. The Commission on Elections earlier reminded candidates that there should be no campaigning done during the Holy Week to preserve the solemnity of the season. The photos come after Poe topped a recent SWS mobile survey where she pulled away from other candidates with 35 percent. Davao City Mayor Rodrigo Duterte was at second with 26 percent.